I have always been really picky about which first-person dungeon crawlers I find enjoyable. I like a good balance between combat and exploration in these titles. 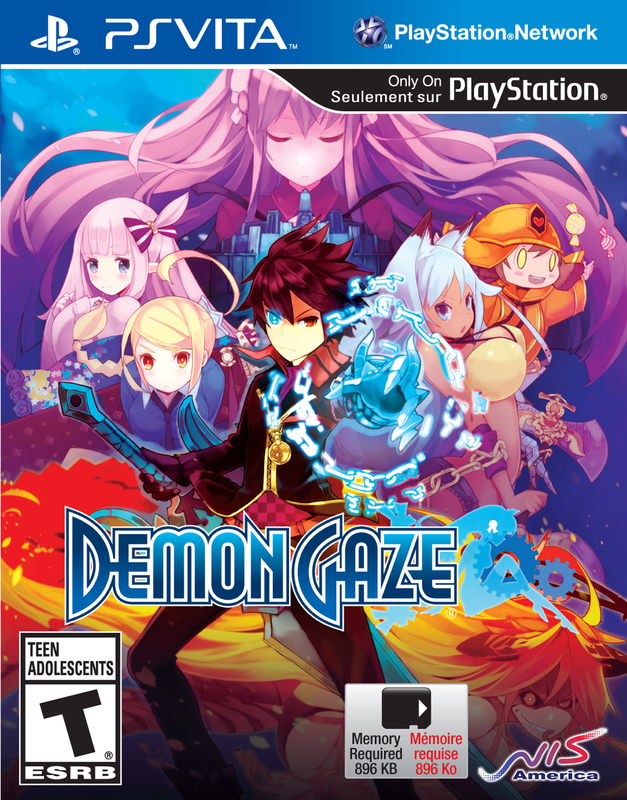 So, when NIS America announced they were localizing Demon Gaze, I was pretty excited to see if this title could meet my expectations. Let’s find out how it did. The story begins in the land of Misrid, a land controlled by demons. Many hunters explore the labyrinths daily to make a living. You awake in a dungeon, with your memories lost and a strange power to control demons. You are the Demon Gazer. Will you be strong enough to unlock the mysteries of this land? 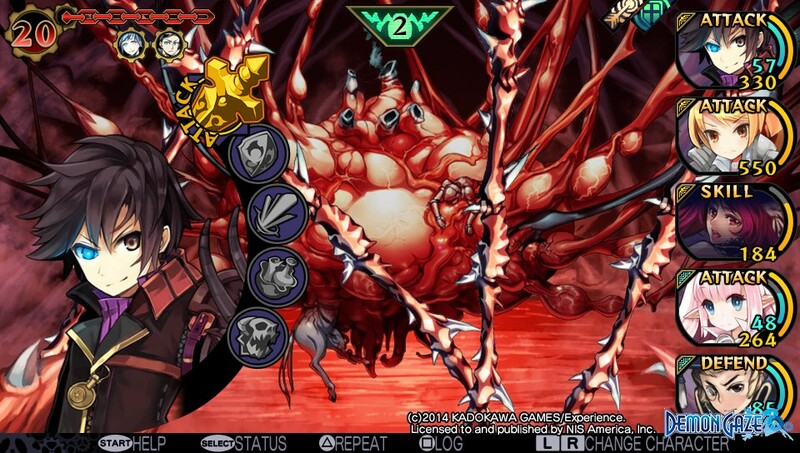 This is the basic premise of Demon Gaze. The storyline overall is pretty well done; you meet the other characters at the Dragon Princess Inn, which also serves as the hub for gameplay. Each of these NPC characters will have a bit of backstory that is revealed little by little. I found the story pretty interesting overall, and it keep you guessing as to what will happen next as they mystery of where you came from and who you are comes to light. It kept me motivated to push through even the toughest labyrinths to see what would happen next. There was also a good balance of serious moments, with some lighthearted fan service mixed in to break up all the Debbie Downer moments. The graphics are kind of a mixed bag, but let me say first that the character and monster designs are just fantastic. The artwork here is simply amazing, some of the best I’ve seen in a long time. The Vita’s OLED screen brings out the bright colors and makes it just a plain joy to look at. My real issue here is that the dungeon environments themselves look a little plain. You might expect this from this kind of game, but, when you compare it the amazing artwork, it throws things off a bit. The sound department is, yet again, a mixed bag. The music, when present, is fantastic. However, there are some dungeons that have little-to-no background music. Instead, they just have ambient sounds of nature or the environments instead of music. It’s not really a horrible thing, just odd since the rest of the soundtrack is great. Especially this battle theme sung by vocaloid IA. The sound effects themselves are pretty plain, with the bangs and clangs of battle. However the voice acting here is great. Your created characters have tons of voice options from which to choose. There is a ton of English voiced story dialogue, as well. This is all nicely done, and the English voices fit the characters well. Never fear, you purists out there, this one is dual audio, so the Japanese voices are here, if that is your cup of tea. The gameplay is that of a typical first-person dungeon crawler. 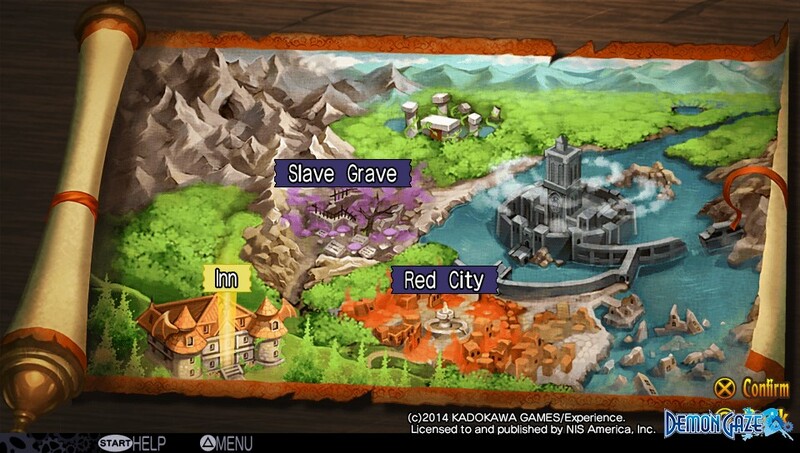 You will take quests and venture forth into labyrinths to hunt monsters, find items and a few other tasks. Before we can venture out, though, we will need to form a party. Remember how I said earlier that the inn was the hub of the game? To increase your party size, you first will have to rent more rooms to house them. This is a one-time fee. You can have up to five party members at a time. However, every time you come back to the inn you will be required to pay a bit of cash for rent, if you cannot pay you will be issued an IOU and suffer penalties. This rate will steadily increase as the game progresses, and is kind of an annoying mechanic to be honest. Creating party members is really simple, unlike a lot other games in this genre. You have five different races to choose from: Human, Ney, Elf, Dwarf and Migmy. There are eight different classes, as well: Fighter, Wizard, Healer and so on. As with any game like this, certain races are better-suited for certain classes. For example, a human is balanced and can do just about anything, while a Dwarf would be a better physical fighter. While classes like the Fighter and Wizard are pretty straightforward, more advanced players will have more fun with an Assassin since they get a lot of different skills and can be used many different ways. The artwork for the character portraits here is fantastic. There are several to choose for each race and gender. 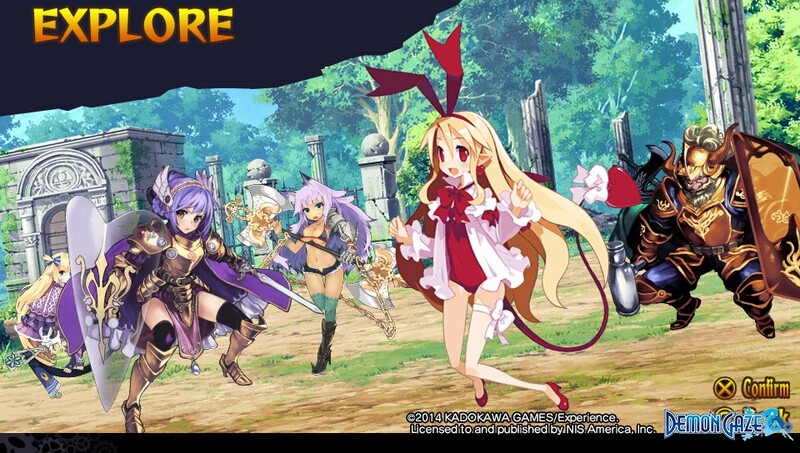 For a limited time, you can download character artwork from the Disgaea series for free, and, I mean, who doesn’t want Flonne in their party! Now that your party is assembled, you’re ready to venture into the labyrinths. If you go to the hall in the end, you will find the Bulletin Board. This is where the various quests in the game are listed. I figured there would be lots of sidequests throughout the game, but there really aren’t that many. It stays focused on the main storyline most of the time. Not that this is a bad thing, I just found it odd. Combat is a turn-based affair. Yep, pretty much like every other dungeon crawler out there. Though, I will say this combat is fast-paced, and there are plenty of skills and tricks to master. Enemies will appear in rows on the battle screen. This works much like it did in Class of Heroes 2. One of the most interesting aspects of the combat is the ability to use the demons you have captured with your “Demon’s Gaze.” Each demon will act on its own during combat once summoned into battle. They may provide support or really powerful attacks to aid your party. There is a catch here, however. You have a Demon Gauge at the top right of the screen. This meter will deplete the longer the demon is in battle. If it reaches zero, the demon will go berserk and attack you party. They probably calm down after battle, but I don’t know for certain because when it happened to me I didn’t survive. Never fear, though, the meter will refill as your party attacks the on-screen enemies. Demons may also have special skills they can use that will cost a bit of your Demon Gauge, but are very helpful. You perform these skills without summoning the demon into battle. The main quest here involves you capturing demons with your Demon’s Gaze. Once you have captured them, they will be usable to you in combat. Throughout each map, you will find several magic circles. These boss battles are epic, so you better bring your A-game, or you will find yourself staring at the title screen really quickly. You will need to claim all of these points on the map make the demon appear, at which point you can capture it. When you first approach a magic circle, it will pull a menu listing all the various gems you have acquired. These gems will make the monster you fight at these points drop different types of equipment and items, depending on which type of gems you use. If you use Helmet Gems, you’ll have a higher chance of them dropping helmets, or, if you use Sword Gems, you’ll have a higher chance of getting swords. You can obtain some very nice items in this fashion. Once you defeat the group of enemies that are spawned and pick your gems, the circle is yours. You can now use this circle to save your game, these are THE ONLY PLACES YOU CAN SAVE WHILE IN THE DUNGEON, or change out your equipped demons.